Chef Jason Heard has a bold take on the classic befitting this Inman Square institution. 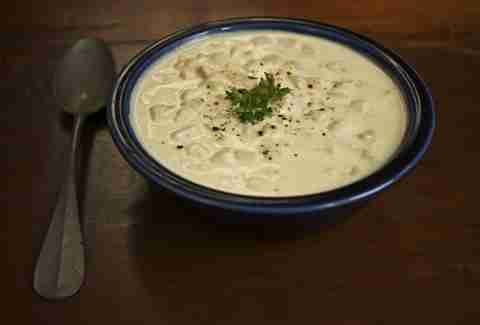 Clams go swimming in heavy cream (lucky clams! ), white wine, and clam juice along with bacon, celery, onions, grilled corn, sweet potatoes, and pureed chipotles (for a nice hint of heat). Chopped sage tops it off and ties the whole thing together. The fresher-than-fresh seafood kings at ICOB up the ante in their version of the regional specialty. Chef Jeremy Sewall, deeply committed to ocean/farm-to-table creations and intricate preparations, incorporates house-smoked bacon into the mix with an abundance of local hand-dug top-neck clams. 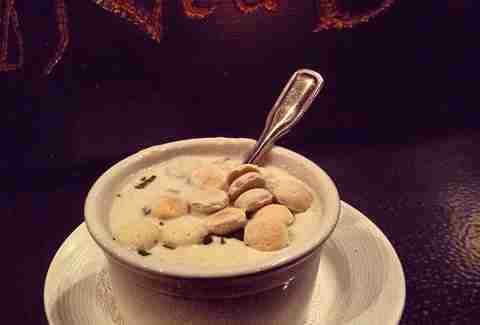 Instead of saltines or oyster crackers, ICOB serves it up with melt-your-brain buttermilk biscuits. Assuming it didn't already melt from the house-smoked bacon. James Hook, a Boston institution since 1925, rebuilt their humble shop after the devastating 2008 fire, because THAT is just what tough New Englanders do, damn it. 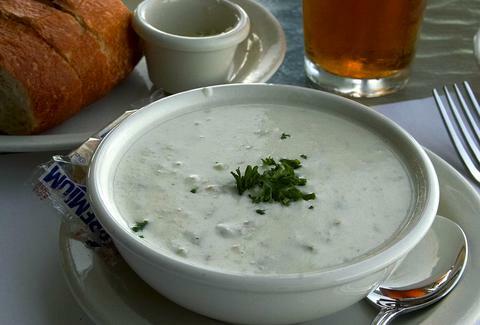 This classic crab shack on the water cooks up honest working-man’s chowder (a two-time Boston Chowderfest champ) with tender and sweet whole clams and plenty of potatoes in clam broth and cream to keep your belly warm. Lick the bowl clean while you’re there and/or buy a half gallon (yep) to take home. Order online if you’re snowed in. 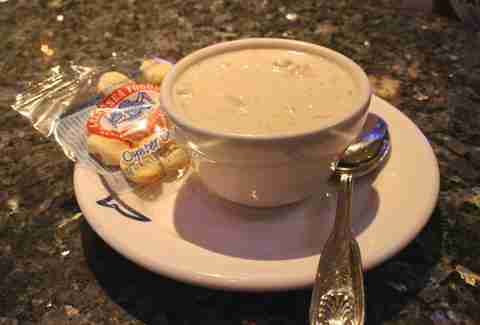 Who knew Ned Devine’s had some of the best chowder in the Hub (besides the Briar Group)? This three-time Chowderfest champ is bursting with flavor (and clams), has a medium texture (aka just right, according to the Goldilocks porridge index), and is crowned with fresh thyme. Simple and effective. 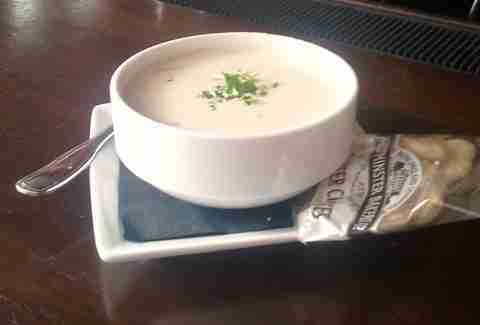 Apparently the Briar Group is really into chowder, because their venue Anthem also boasts two victories and two runner-up finishes at Chowderfest. Chef Ben Hennemuth’s rendition is velvety smooth, stocked with clams and potatoes, and nuanced with secret special spices. Probably something addictive. Not meth though, at least we don't think. We can't forego an obligatory nod to the standard bearer. 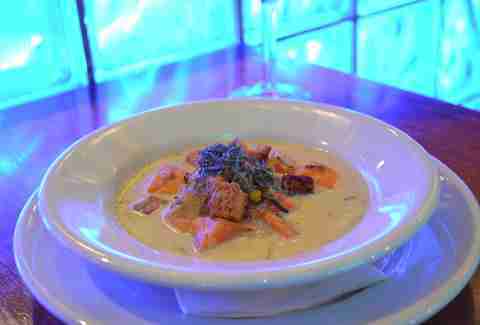 There’s a reason why this dish has represented the Commonwealth of Massachusetts at every Presidential Inauguration Dinner since Ronald Reagan’s January 1981 fete: it’s damn good chowder. 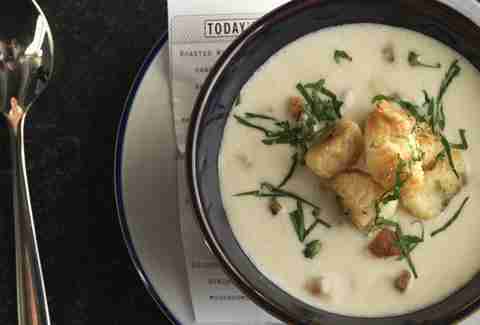 With plenty of littleneck clams, potatoes, onions, and salt pork flavor-melding in clam broth, fish stock, and light cream, Legal’s much-celebrated version is everything that everyone imagines New England clam chowder to be. Bonus: here’s the recipe. Double bonus: if you are kitchen-averse, you can order it online.